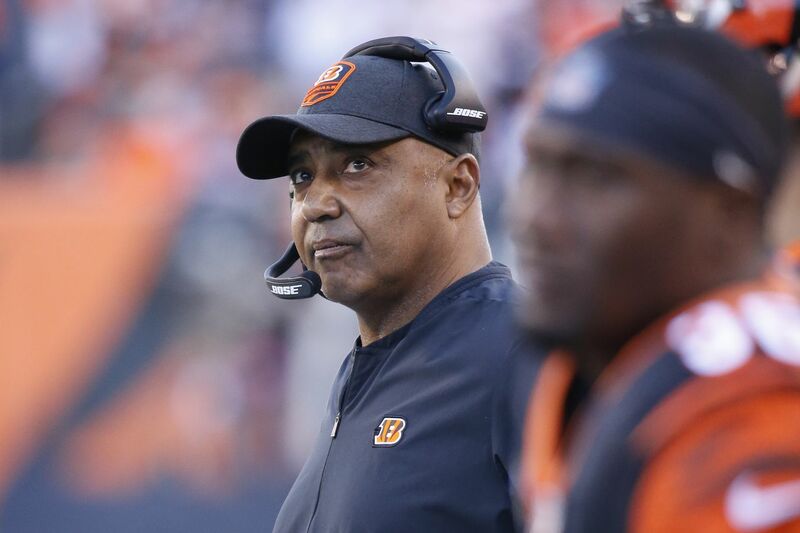 Cincinnati Bengals head coach Marvin Lewis was among coaches fire Monday morning across the NFL following the end of the regular season. There were eight head coaching vacancies across the NFL before noon Monday, including in Cincinnati, where head coach Marvin Lewis was fired by the Bengals after 16 seasons. Lewis is one of five black NFL head coaches who have lost their jobs this season (Hue Jackson, Todd Bowles, Steve Wilks, and Vance Joseph are the others). That leaves Mike Tomlin of the Pittsburgh Steelers and Anthony Lynn of the Los Angeles Chargers as the only African-American head coaches remaining in the league. It’s also worth pointing out that Eagles coach Doug Pederson is the only remaining head coach from the class of 2016, when a total of six new coaches were hired. At the time, ESPN’s Ian O’Connor ranked Pederson as the league’s worst coaching hire, calling it “a reach." A quarter of the NFL’s 32 teams will have a new head coach at the start of next season. And one team -- the Atlanta Falcons -- will be searching for three new coordinators: Offensive coordinator Steve Sarkisian, defensive coordinator Marquand Manuel and special teams coordinator Keith Armstrong were all fired on Monday. Here’s a round-up of teams with head-coaching vacancies heading into the offseason, and potential replacements. The Bengals decided to fire longtime head coach Marvin Lewis after the team limped to a 6-10 record to finish the season. According to ESPN, Lewis had one season remaining on a contract extension he signed last year. So far, the names that have cropped up to potentially fill Lewis’ spot include two fired head coaches — Hue Jackson, who was canned by the Browns earlier in the season, and Vance Joseph, dismissed from Denver. The Bengals are also reportedly looking to interview Rams quarterbacks coach Zac Taylor, brother of Eagles QB coach Press Taylor. Source: The #Bengals have requested to interview #Rams QB coach Zac Taylor for their vacant HC opportunity. The Cardinals fired head coach Steve Wilks after just one season, making the move official late Monday morning. Wilks finished the season 3-13, the worst record by a Cardinals coach in 18 years. He becomes 10th NFL head coach since 2000 to lose his job during or after his first season. Names rumored to be in the mix to replace Wilks include Kansas City Chiefs offensive coordinator Eric Bieniemy and former Green Bay Packers head coach Mike McCarthy, who was fired in early December and has been linked to just about every head-coaching vacancy. The Dolphins fired Adam Gase on Monday morning after the team was embarrassed by the Buffalo Bills on Sunday in a 42-17 loss. Gase coached the Dolphins to a 10-6 record back in 2016, but since then has posted a disappointing 13-19 record in what is likely the worst division in the league. According to Pro Football Talk’s Mike Florio, Dolphins owner Stephen Ross is so high on John Harbaugh that the team could consider trading for the Baltimore Ravens head coach, who is scheduled to return in 2019. Ross is also high on Harbaugh’s brother, University of Michigan head coach Jim Harbaugh, but it seems unlikely he’ll be able to pry the former 49ers head coach away from his alma mater. Vance Joseph is the third head coach to be fired by Hall of Famer John Elway during his eight-season tenure as the team’s general manager. Like his predecessor, Gary Kubiak, Joseph lasted just two seasons in Denver, where he led the team to a disappointing 11-21 record. The Broncos have reportedly already requested permission to interview two people: Steelers offensive line coach Mike Munchak and Patriots defensive coordinator Brian Flores, who appears to be at the top of the list for many executives. Other potential candidates include Chargers defensive coordinator Gus Bradley and Bills defensive coordinator Leslie Frazier, who has previously interviewed during Elway’s tenure, according to ESPN. The Jets fired head coach Todd Bowles Sunday night after the team finished with a 4-12 record, despite Bowles' two-year contract extension signed at the end of 2017. In three seasons with the Jets, Bowles went just 14-34. Among the names mentioned for the Jets’ open position are Titans offensive coordinator Matt LaFleur and Iowa State’s Matt Campbell, two offensive-minded coaches who might aid in the development of quarterback Sam Darnold. Source: The #Jets have requested #Bucs OC Todd Monken. One of the top offenses in NFL and head coaching background. Makes sense, especially with the focus on RPOs. Campbell has reportedly declined a chance to interview for the job. The Buccaneers fired Dirk Koetter on Sunday night after a 34-32 loss to the Falcons. He had coached Tampa Bay to a 5-11 season and ended with a 19-29 record overall since he was promoted to head coach in 2016. Tampa Bay has hired an outside search firm to assist in finding its next coach, which will be the team’s fourth hire since 2012. Ex-Cardinals coach Bruce Arians, who retired after last season, has expressed interest in the job even though he previously said he’d only be interested in coaching the Browns. Arians is still under contract with Arizona. He’s known Tampa quarterback Jameis Winston since middle school, according to the Tampa Bay Times. Other names who have surfaced include ex-Lions coach Jim Caldwell, and both Jim and John Harbaugh. Also surfacing in the search? Jim Schwartz, the Eagles’ defensive coordinator. Mike McCarthy was stunningly fired on Dec. 2, in the midst of his 13th season as Packers head coach. With Aaron Rodgers starting for 10 of those years, McCarthy amassed a 125-77-2 record and led Green Bay to a Super Bowl win in 2010. But things got off to a bad start in Wisconsin in 2018. The Packers were 4-7-1 when McCarthy was fired following a loss to the Cardinals, who finished 3-13. The Packers limped to a 6-9-1 finish under interim coach Joe Philbin. Philbin will be interviewing for the job this week, according to ESPN. Caldwell and Chuck Pagano, ex-Colts coach, both interviewed for the job last week, and reports are saying the Packers will make a push for Pat Fitzgerald, who just coached Northwestern University to its first Big Ten title game. The Packers have also expressed interest in Saints tight ends coach Dan Campbell. The Browns fired Hue Jackson at the end of October. Jackson was hired in 2016 and got off to a rocky start in Cleveland; he didn’t win his first game with the Browns until Christmas Eve of that year. The rest of his tenure didn’t go much better: Cleveland went winless in 2017 and was off to a 2-5-1 start this season with Baker Mayfield under center when Jackson was canned. Two obvious names to fill the vacancy have emerged: Gregg Williams, the team’s interim coach, and Freddie Kitchens, the offensive coordinator. Williams has led the Browns to a 5-3 record since Jackson was fired. General manager John Dorsey told ESPN he also plans to conduct a “full and complete” search. ESPN is reporting the Browns asked to speak with the Patriots' Flores, and they’ve also been linked to McCarthy. Team owner Jimmy Haslam has been high on Patriots offensive coordinator Josh McDaniels in the past. The Browns are also reportedly looking at the Saints' Campbell. The #Browns have put in a request to interview #Colts OC Nick Sirianni, source says.